Coke Life contains 35% fewer calories than normal Coca-cola (60 calories / 8oz), and is sweetened with plant-based sweetener stevia (and blended with sugar). The drink has had successful launches in the USA, Argentina and Chile, and Great Britain. Many drink manufacturers have been facing criticism regarding their contribution to the obesity epidemic, and this is their response. The green coloring of the labelling (exactly the same as rival Pepsi True) is meant to imply healthly - however the drink does still contain sugar. Caffeine in the 330ml Coke Life sold in the UK is 26mg (less than the 34mg found in regular Coke). Other variations of coke are sweetened with corn syrup (regular Coke), or aspartame (Diet Coke). 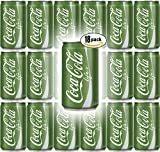 Coca-cola life comes in various sizes in different markets. Carbonated water, sugar, caramel E150d, natural flavourings (caffeine, phosphoric acid, steviol glycocides). Sugar content: 17 grams (per 12 ounces). How Does Coca-Cola Life Compare? 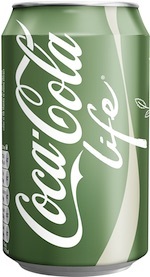 Coca-Cola Life contains 2.33 mgs of caffeine per fluid ounce (7.89mg/100 ml).